With a focus on luxury sport yachting, Tiara Sport offers sophisticated vessels ready to meet the demands of day yachting. 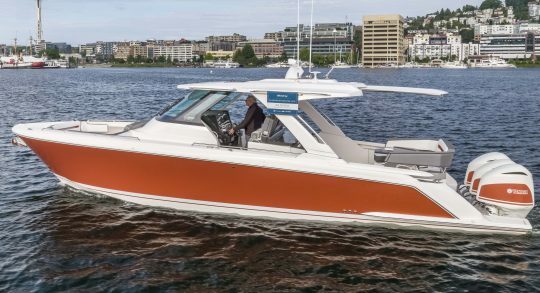 The epitome of functionality and comfort, Tiara Sport LS features walk-around capabilities, multiple and easily accessible social zones, and ample lounging accommodations, including wrap around forward bow seating. Powered exclusively by Yamaha®, the 34 LS and 38 LS are ready to perform. Captain and guests will delight in the thrilling performance aboard. Glass Cockpit integrated electronics, including the latest Garmin® marine navigation systems provide ease of use, and optional Yamaha® Helm Master joystick steering provides additional control underway or docking. Available in 34 and 38-feet, luxury sport yachting is elevated to new heights. Experience performance, power and the joy of motion aboard the Tiara Sport LS models. We have a few varieties of Tiara Sport boats for sale. You can either purchase something standard or order a semi-custom boat that’s unique to your specifications. You won’t find a better place to get your Tiara Sport boat.